news and strategies for the evolving mortgage market AUGUST 2016 THEMREPORT.COM Special Section: RISK & DUE DILIGENCE GUIDE Companies that are leading the due diligence pack. 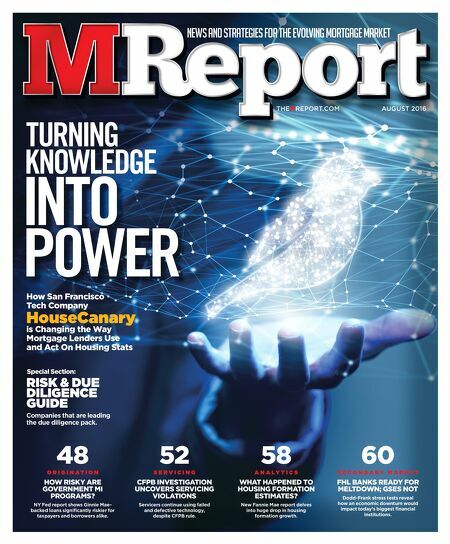 How San Francisco Tech Company HouseCanary is Changing the Way Mortgage Lenders Use and Act On Housing Stats 48 O R I G I N A T I O N HOW RISKY ARE GOVERNMENT MI PROGRAMS? NY Fed report shows Ginnie Mae- backed loans significantly riskier for taxpayers and borrowers alike. 52 S E R V I C I N G CFPB INVESTIGATION UNCOVERS SERVICING VIOLATIONS Servicers continue using failed and defective technology, despite CFPB rule. 58 A N A L Y T I C S WHAT HAPPENED TO HOUSING FORMATION ESTIMATES? New Fannie Mae report delves into huge drop in housing formation growth. 60 S E C O N D A R Y M A R K E T FHL BANKS READY FOR MELTDOWN; GSES NOT Dodd-Frank stress tests reveal how an economic downturn would impact today's biggest financial institutions.